Are you bored of the beach and tired of tavernas? Maybe you are looking for a different holiday experience or something to add to your Bucket List? If so, you might like to consider a visit to Antarctica. If you re-read that in disbelief, I assure you it is not a typo. 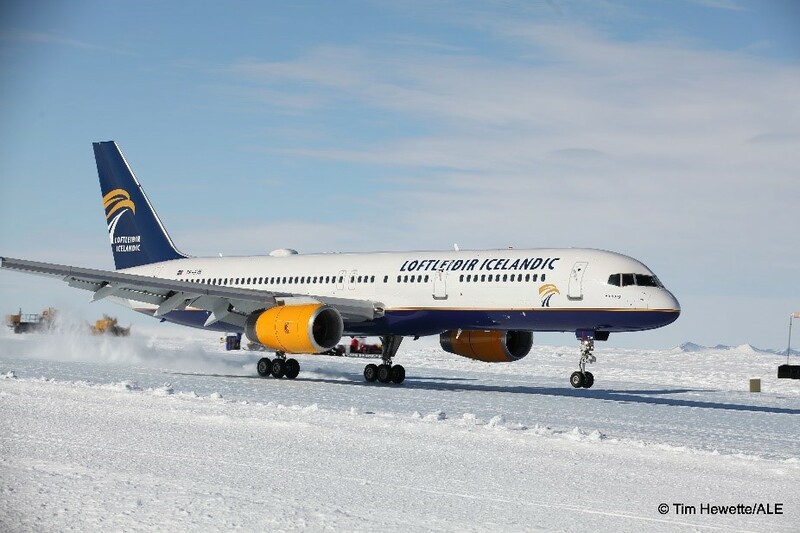 A Boeing 757 passenger airliner recently landed on the blue-ice runway at Union Glacier to demonstrate the feasibility of such aircraft in providing a commercial service in the future. Until now, flights to Antarctica have been made using aircraft such as the American Lockheed Hercules or the Russian Ilyushin; Sturdy workhorse cargo-aircraft with basic passenger facilities. The project is a joint partnership between tour operators Antarctic Logistics and Expeditions (ALE), Loftleidir Icelandic, a subsidiary of the Icelandair Group and Niche Aviation Solutions (NAS) Corporation, a freight logistics company based in Hampshire. A specially adapted Boeing 757-200 ER aircraft has been fitted with 62 business-class seats offering passengers a more comfortable, thoroughbred racehorse experience on their journey to the white wilderness. So far there is no definite timescale to setting up the commercial passenger flights but ALE spokesperson Leslie Wicks believes they could do so within two or three years. If you prefer to travel in style, then this is good news, but you better start saving now. Currently, ALE’s week long excursions including (less comfortable) flights from Punta Arenas, Chile, and food and accommodation will set you back about £16,000. So what is the fascination with this white mass around the South Pole? In terms of accessibility, this is the final frontier. Antarctica is the coldest and surprisingly driest continent on Earth with the highest elevation. There is no significant plant or animal life in the interior although the shoreline and surrounding ocean is home to an abundance of fish, birds and marine mammals. The climate is harsh all year. For tourists Antarctica is only accessible during the summer season, between November and March. Daytime temperatures average between -1o and 4o C although it may reach as much as 14o C near the coast. During mid-summer there are twenty-four hours of daylight. By comparison, winter, temperatures drop to as low as -40o C, the sea is impassable and there is twenty-four-hour darkness. It is said that there is no such thing as bad weather, only the wrong clothing. Even so, packing for a short stay will be a considerable task. Virtualtourist.com offer advice on what to pack including a helpful section from people who have travelled to Antarctica. The list is extensive and surprisingly includes sun protection cream. It is still possible to get sunburn as the UV rays are very strong and the ozone is very thin. Antarctica covers an area of approximately 14,000,000 sq. km south of 600 S latitude and is unique in that it is not owned by anyone. There are no native inhabitants and no government in overall control. Instead, Antarctica is regulated under the Antarctic Treaty System. This comprises the Antarctic Treaty of 1959 and other associated agreements. Originally, twelve countries including the United Kingdom signed the treaty which was to ensure, “in the interests of all mankind that Antarctica shall continue forever to be used exclusively for peaceful purposes and shall not become the scene or object of international discord.” Military activity is prohibited as are nuclear explosions and the disposal of nuclear waste. The success of the treaty, which has no expiry date, is seen in the growth of membership countries. Currently 52 countries, about 80 percent of the world population have subscribed to it. Visitors to Antarctica must comply with the Treaty and are of course bound by national laws and regulations. Before tourism, Antarctica was almost exclusively visited by scientists for research purposes with support teams such as cooks, electricians and medics. These stalwart travellers could be in residence from three to eighteen months so many tons of provisions were required to last the duration. ALE first began by providing logistical support to such research programmes before branching out into tourism. For those who prefer sea travel, the window for visiting Antarctica extends to March before ice begins to form around the coast. There are many tour operators who will arrange custom visits to suit the individual’s needs. It is best to browse through the International Association of Antarctic Tour Operators (IAATO) first as they advocate and promote safe and environmentally responsible practices for private-sector travel to the Antarctic. A full directory of members can be found at http://apps.iaato.org/iaato/member/list.xhtml . Large-ship cruises offer luxury travel but may be restricted in how close they can get to shore. Smaller ship expeditions are able to travel nearer to the coast and take passengers ashore in small rib craft. Some ships have their own helicopter so can take small groups on visits to the interior. An 11-day tour with Swoop Antarctica sails from Ushuaia on the Tierra del Fuego archipelago, the southernmost port in Argentina. After a two-day journey across the Drake Passage you arrive at the Antarctic Peninsula. A full activity programme is available including hiking, camping on ice, visits to wildlife colonies, kayaking and visits to historic huts and science stations. Prices start from £5,509 excluding flights to/from Ushuaia. It is also worth noting that there are no direct flights from the UK to Argentina, but you can route via Paris or Amsterdam. Another option is to fly from London to Buenos Aires, Brazil and then onwards. In 2003, ALE began offering weekly scheduled passenger and cargo flights from Punta Arenas, Chile to their main camp at Union Glacier. The camp operates between November and January, with a flight time of four hours and 15 minutes. Flights can hold 60 passengers or two shipping containers of cargo and are of course weather dependent. For local flights to more inaccessible areas, ALE have at least two ski aircraft such as the DHC-6 Twin Otter or the Basler BT-67. 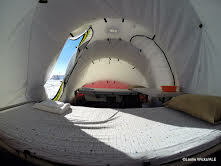 They have fuel storage areas located around West Antarctica to enable self-sufficiency and for emergency requirements. Once on the ground, or rather on the solid water, there are plenty of options for sight-seeing and once-in-a-lifetime experiences provided by Adventure Network International (ANI), a subsidiary of ALE. ANI run Union Glacier base camp and field camps. Set in this spectacular landscape, they have everything you need for a comfortable stay. Accommodation is in spacious, double-walled tents which sleep two guests. Polar sleeping bags, pillows and linen are provided. Tents are heated naturally by the twenty-four-hour sunlight and temperatures range from 4o C – 20o C. Meals are prepared and served in a large dining tent. A wide selection of fresh meat, fish, fruit, vegetables, beer and wine is flown in regularly from Chile. This space is also used for briefings and talks and is the communal meeting place for activities. ANI offer seventeen tailor-made experiences graded from easy to extremely strenuous. These include overland expeditions, ice climbing, wildlife viewing, photography and many more, for the full range visit http://www.adventure-network.com/experiences. If you fancy flying down to the South Pole and camping out overnight, try the ‘90o South Overnight’ trip. For the more adventurous there is a two-week challenge. 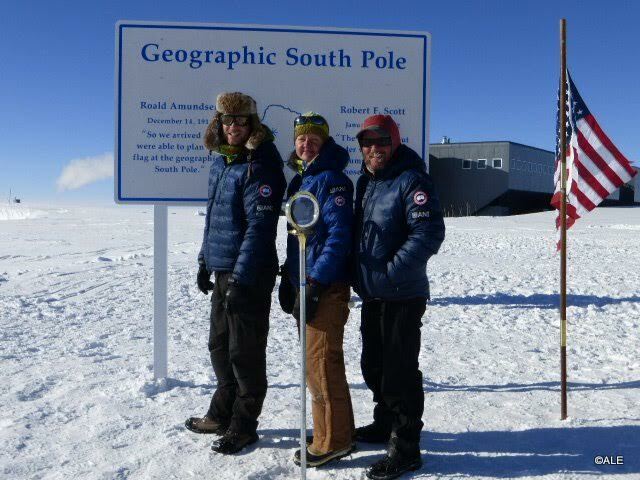 The ‘Ski Last Degree’ tour flies down to 89o S from where the team ski and sled the last 60 nautical miles to the Geographic South Pole. While there you can imagine the heroic journeys of the early explorers Scott, Amundsen and Shackleton who ventured into the unknown over 100 years ago. It may also be possible to visit the Amundsen-Scott Station, a research centre where scientists are at work studying the Antarctic environment. Antarctica offers something for everyone as long as you don’t mind the cold. Whether you go by sea or air, this will definitely qualify for the trip of a lifetime.